Richard Ainsworth Service Details - Kitchener, Ontario | Henry Walser Funeral Home Ltd.
— Henry Walser Funeral Home Ltd.
Predeceased by parents Jack and Nancy Ainsworth and brother Donald. A graduate of McMaster University, survived by two grandsons, Steven Gombos and Joseph Mazur whom he adored; loving wife Dorothy Norris and 3 children Tammara Gombos (Steve), John (Carrie Xavier), Alison (Liam), two brothers, Gary (Joan) and Kenneth (Betty Lou). 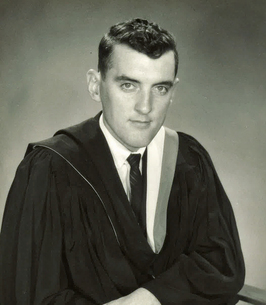 Worked for IBM, Harding Carpets, Massey Ferguson ITT and St. Joseph's Hospital Brantford, taught in Private Education at Upper Canada College and Muskoka Lakes College, University of Guelph and the public system at Ridgeway High School, BCI, St. John's College and Assumption College School. Special gratitude to the E Shift Programme for Care Partners, namely Melissa and Ric for their exceptional and gentle loving care. Thanks also to Betty McKinnon whose empathetic assistance was constant and caring. Richard loved life and most of all spending time with his family. His hobbies included fine woodworking, gardening, reading, music and baseball. Richard's family will receive relatives and friends at the Henry Walser Funeral Home, 507 Frederick Street, Kitchener, 519-749-8467 on Thursday, October 11, 2018 from 4-7 p.m. Private Cremation. In lieu of flowers, donations to a charity of your choice would be appreciated by the family (cards available at the funeral home). Visit www.henrywalser.com for Richard's memorial. We encourage you to share any memorable photos or stories about Richard. All tributes placed on and purchased through this memorial website will remain on in perpetuity for future generations.